One afternoon this week, I found myself leaving the playground after school pickup with only one child. Elliott said to me quietly as we did so, as I picked up the bag of Nicholas' extra things he did not need for basketball practice and spotted Julia walking with her group over to her dance class, it is just like when I was at school for half days. We get the afternoon together. Ah, yes. Those wonderful afternoons in which he and I would come home after I picked him up from school, eat lunch together and spend a few hours together, just us. Reading. Drawing. Walking. Being together. Some times quite imperfectly, but still, in a way that we both relied upon to reconnect. He and I both miss these afternoons, though the missing has eased a bit over the past few months as he adjusts to full day school. But we both got a bit excited for our afternoon hour and a half together before everyone else came home. And in the flurry of dinner making and homework and practicing that I knew would inevitably come once everyone was home, I knew his quiet voice and slower pace would get, gets, a bit lost. We headed home, with a brief stop for the perfect just us accessory, and made a snack. Our usual. Popcorn by me. And a special secret recipe he has created for hot chocolate. The hour a bit later today, with the sun already falling below the trees, the chill setting in and the days shortening, the afternoon sun fell away. And so, just as our days have moved from afternoons mostly together to afternoons mostly apart, the sun moved just as quickly forward, and in the time it took to make this favorite snack he and I, the light changed from bright to dwindling. It is easy with our children, but especially for Elliott, to forget his youngness. To forget that I wish for him the same childhood that Julia and Nicholas had, of time to play, to wonder, and to be. I used to lie on a blanket in our backyard with Nicholas, in that last hour before Jonathan would get home from work, and play I Spy with the clouds. Doing nothing else but trying to look at something the way that he did. To see through his eyes. But two children later, and the schedules of growing children. It is easy to forget that all of this is new to Elliott, even though the rest of us have all done this several times before. And that he still needs this space and time, the coming back to us, the quiet, the nestling. Being read to. At a pace that allows his mind time "for waiting and time for looking and time for wondering[.]" And then, we built a fire together in the wood stove and sat down in front of it, a huge bowl of popcorn at our feet and mugs in our hands. What had we picked up on our way home? Well, we had stopped by our local branch of our public library. For a book that was waiting for me on the holdshelf. As Elliott and I sauntered off the playground and danced across the cross walk, I had remembered a book was waiting there for me. And knew I wanted it to be a part of our afternoon. I had been thinking about this book, anticipating it and wanting to read it with Elliott, for a few days since I had heard about it. 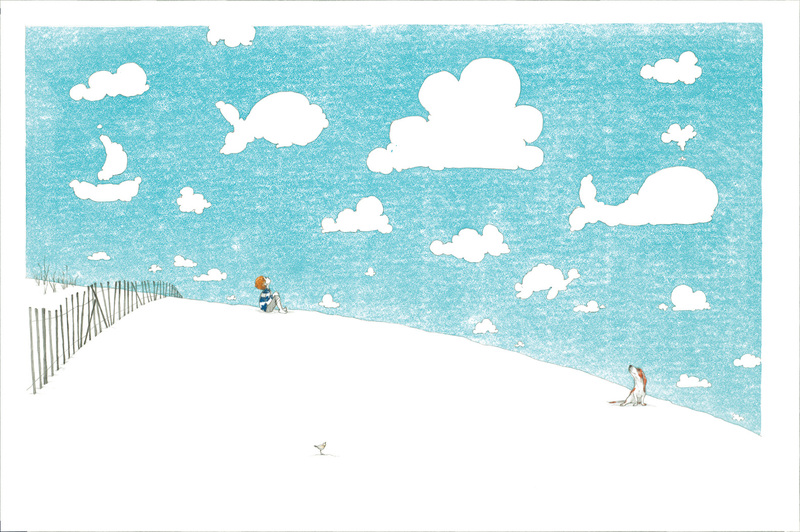 Julie Fogliano and Erin E. Stead's If You Want to See a Whale. 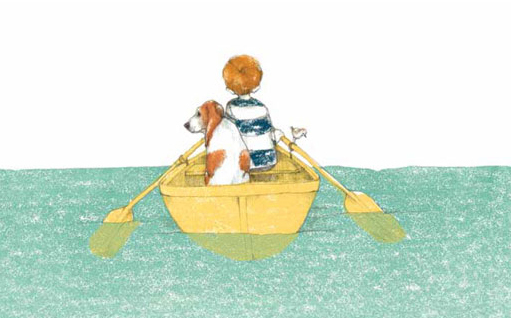 I was excited, because this book, And Then It's Spring, also by the Fogliano and Stead team, and this picture below, still represents Elliott's little self in ways I never would have been able to put to words. And so, to this talented author and illustrator team, I am already extremely grateful. 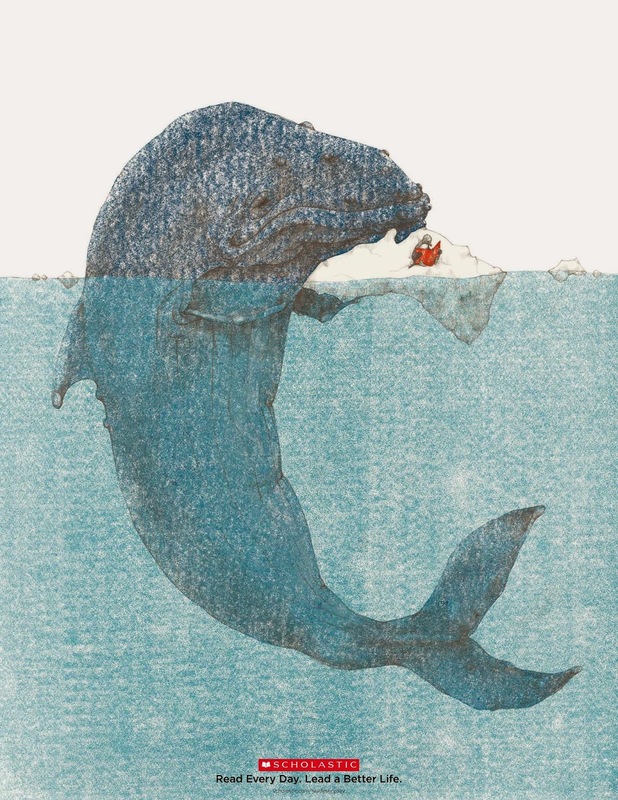 So If You Want to See a Whale, with its slow pace, quiet words, detailed and seductive illustrations (a bit of a temptation-to-caress problem given the butter on our fingertips), and huggable grippable size. About giving children the time and space to wonder and imagine. I had to have it for our afternoon together, to not leave it alone and unread on the holdshelf a day longer. I read about this book here and immediately went to our public library's website and did my usual, search, entering the title and then, if I am lucky enough that our library has it, putting it on my list of books to gather next time we are at the branch. Or, if another library in our city's system has it, requesting that it be brought to our local branch for pickup. Or, if no branches have a copy, I go to the statewide library sharing system, MaineCat, and see if I can get my mitts on it there. And then, on the sad day that I can find it nowhere? I wait. Until some library does. For If You Want to See a Whale, I found that there was an available copy at our library's branch out on Peaks Island. I pressed request, and them imagined the trip that this book would have to take to us. Perhaps like this? Delivered by a small and quiet boy and his dog, across Casco Bay. Perhaps lovingly delivered by this island boy who wanted to put it directly into the hands of another small boy, who would love it just as well. But this book would likely ride the ferry across Casco Bay. Sit on a shelf our our small local branch in a residential neighborhood nearby, decidedly not island. And then, be picked up by Elliott and I on own way home from school, a skip in both our steps as we hugged the book when it was placed in our hands by the librarian, and headed home to our special snack and just us afternoon. He and I reconnected, shored ourselves up, and had our time together. Our pace slowing to the repetitive and thoughtful pace of this book. Soon, the door slammed and the happy chaos of family life returned, the older kids arriving home, backpacks thudding loudly onto the kitchen floor. Needing lots of things. Snacks. Planning. Forms to be filled out. To be listened to as they told of the day's excitements, bumps, and struggles. Elliott and I gave each other another squeeze. Threw another log on the fire. And carried the still half full popcorn bowl into the kitchen. To join the pace of the rest of our day. Holding hands as we walked into the kitchen. An unspoken and solid tie between us, our breathing quickening to match the happy frenzy in the kitchen, but behind that, a peacefulness and comfortableness of our shared story and afternoon.